Can I just be Jenna Lyons already? Definitely check this piece about her personal style. I'll shut about Old Navy when I stop liking what they release. They just released a ton of festival inspired clothes, but their latest arrival is super J.Crew-esuqe. I mean, these gingham pants? But if you're looking for more 70's inspired clothing, check out this collection. Guess what? I found a fourth roommate! 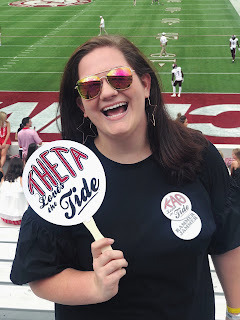 My friend decided she is going Alabama, and I am super excited to have her as my fourth roommate. And y'all, college is coming up so fast. My Pinterest board have been in overdrive with new pins about college. I am really excited but also super nervous. Sports Illustrated did a podcast about the psychology of fandom and self-identification. I haven't had a chance to listen to it yet because I have been so busy, but it's on my list for this weekend! The podcast, This is Your Brain on Sports, has a ton of other really interesting topics including why we root for the underdog and the pressure of an undefeated record. This week I have seen all about Prince William and Kate Middleton's trip to India, but I had not seen the comments people were saying about Kate Middleton. People were criticizing her... feet? It's a weird sexist world out there, and Vogue agreed. I leave you with the Rogue One Trailer.